If you clean your own fish, then you know how hard of a job it can be if you don't have the right tools. 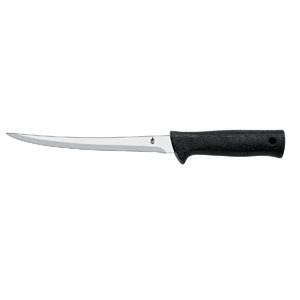 The best fillet knife saves you time, energy, and gets the job done more efficiently. When you are hands deep in guts and sludge, it is critical to have the right knife in hand so that it keeps performing, won't slip, and is perfectly safe to use. 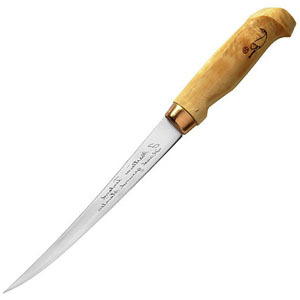 In this article, we are going to look at the criteria for finding the best fish fillet knife, as well as look at the top knives on the market right now. There are many great choices in kitchen knives to choose from. Let's dive right into the factors to look for in a fillet knife. When choosing a knife, it is important to make sure it has a good quality steel that will hold its edge, but you don't want a steel that is too hard, so that you can sharpen it too. Choosing stainless steel will help keep your blade from rusting over time. 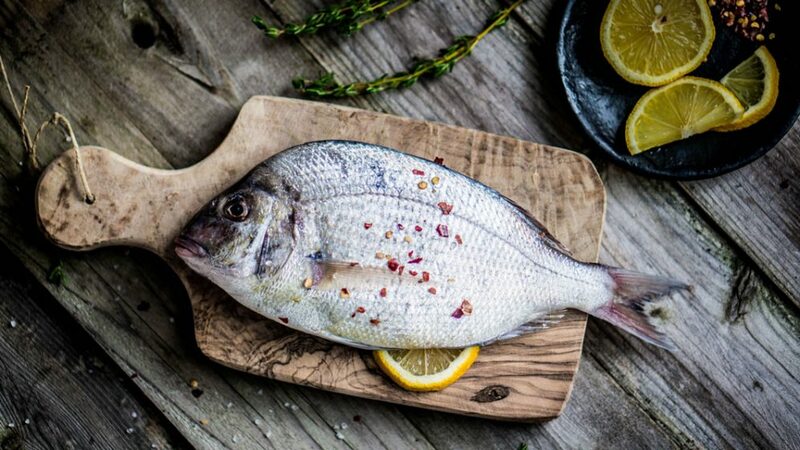 The blade length is a factor to consider with the type of fish that you normally clean. Longer blades are great for bigger fish and of course, shorter blades are better for smaller fish. The common size that is most versatile is around 7 inches. 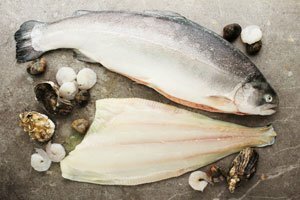 A slight curve shape on a knife helps aid filleting the fish effectively, so it is recommended that you get a slightly curved knife. You want a handle that is comfortable to hold and won't slip out of your hand. The handle material is also important so that it lasts a long time. Better brands make higher quality knives that are designed and manufactured well. Reviewing what other owners are saying about a knife is the best way to learn whether or not it will hold up for a long time. The Rada Cutlery R200 is a fantastic choice for a fillet knife. The knife blade is 7.125 inches of 420 high carbon stainless steel that is surgical grade quality. This is fantastic steel in a knife like this. It is built to last and performs well. The overall length of the knife is 12.25 inches. The black rubber handle has a great grip on it with grooves for your fingers. It comes with a black leather sheath for safe storage that you can clip to your belt. Another great feature is that these Rad﻿﻿﻿﻿a knives have been made in the USA since 1948. Reviewers absolutely love this knife. Buck is a well known knife company with a great reputation. The Buck Knives 220 Silver Creek is another fine choice. It has a 6.5 inch blade made from 420J2 stainless steel. The blade also has excellent flexibility. The blue rubber anti slip handle is very comfortable. 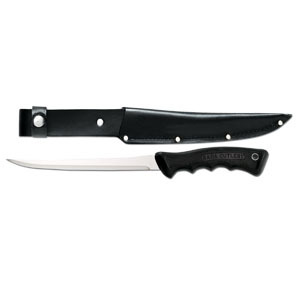 Instead of a sheath, this knife comes as a folder, which is extremely convenient to take along on fishing trips. It can be easily hung or attached to something with its lanyard hole in the handle. If you are going for more of a classic look, then the Rapala Fish'n Fillet might be for you. Its 7.5 inch stainless steel blade is a great performer. It also has a reinforced birch varnished wood handle that gives it a nice personality. The knife comes with a leather sheath as well as a single stage sharpener to meet all of your needs. The Rapala is made in Finland and comes with a brand quality signature on the blade. The knife looks fantastic and performs even better. 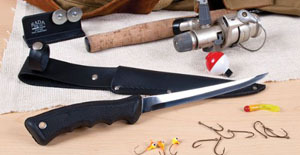 This knife is highly recommended by many avid fishermen. When you go for bigger fish, you often need a bigger knife. That is where the Kershaw Fillet knife comes in for the rescue. It has a 420J2 stainless steel blade that is 9.25 inches long. It has a black plastic handle, and comes with a ABS plastic sheath for storage. There is plenty of flexibility in this knife to help assist you with those bigger fish. Kershaw is a very popular knife company known for their quality. Another great option is the Gerber Gator Fillet. At 7.5 inches, its 420 high carbon stainless steel blade is built to last. 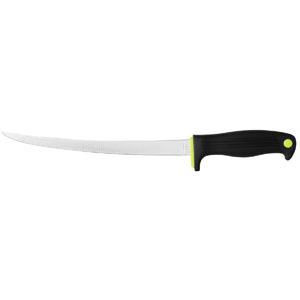 The glass filled Nylon handle has texturing to give you a nice grip on the knife. The overall length of the knife is 12.2 inches. It comes with a hard molded sheath and a built in sharpener for your convenience of storage and maintenance. Gerber is another fantastic knife company. 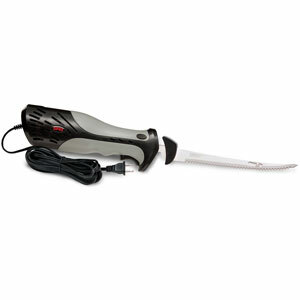 If you are looking for the best electric fillet knife, then the Rapala Heavy Duty Electric Fillet is one of your best options. 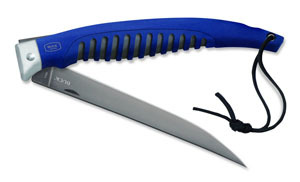 It has a 7.5 inch blade, a great handle, and a heavy duty motor for some of the toughest jobs. When it comes to finding the perfect ﻿﻿knife for fish, there are several factors to look out for. 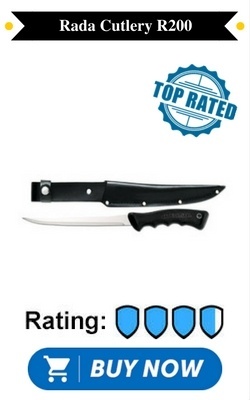 First, we reviewed the different criteria like the blade, handle, and durability. For the blade, we noted that it is important to consider the type of metal, length, and shape. We also mentioned why the handle is an important feature. You need a knife that has a good and comfortable grip that won't slip out of your hand. Finally, we discussed how durability is critical for the long lasting life of the knife. There are many options to choose from, so we looked at the top 5 best ones on the market right now. If you are looking for an overall great knife, then the Rada Cutlery R200 is the way to go. It has great features, high quality, and will last you a lifetime. It is one of the best fillet knives that you can buy. If you are a fan of bigger fish, then consider the Kershaw Fillet with its 9.25 inch long blade that is better suited for that kind of job. And just a final note for those that may not know. These type of quality knives are best cleaned by hand washing to prevent any high heat damage to the blade and handles that might happen in the dishwasher. Also, if you are needing a boning knife, we found a good one. Another great kitchen asset is an electric knife.